Labor cost is a healthcare facility’s biggest expense. Typically, foodservice is second only to nursing in the number of employees. The balance of the staffing pattern to meet service demands affects both the payroll and labor productivity statistics. A reduction in staff does not always lead to improved efficiency. Add staff vs. the efficiency of equipment? Keep a non-essential service or reduce the hours paid. 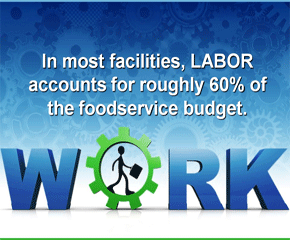 Please contact us for information on how to address your Foodservice Labor concerns.